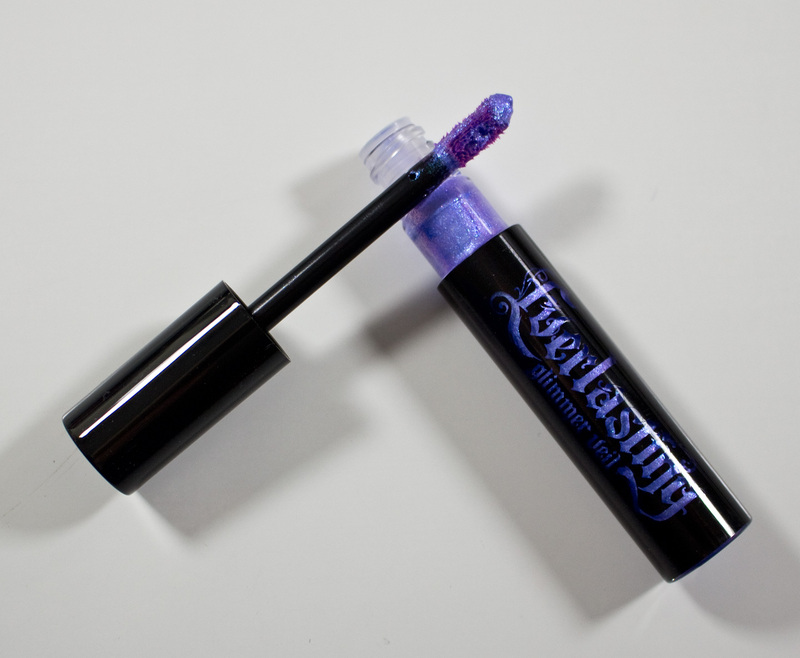 The Kat Von D Everlasting Glimmer Veil Liquid Lipstick retails for $22US and $30CAN for 0.20 fl oz / 6ml of product. Kat Von D Everlasting Glimmer Veil Liquid Lipstick in Starflyer. Kat Von D Everlasting Glimmer Veil Liquid Lipstick in Starflyer labels. 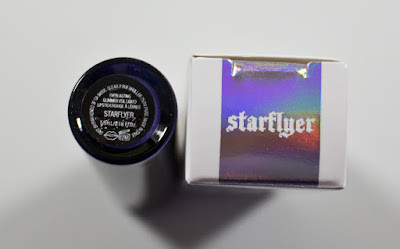 Kat Von D Everlasting Glimmer Veil Liquid Lipstick in Starflyer box and ingredients. 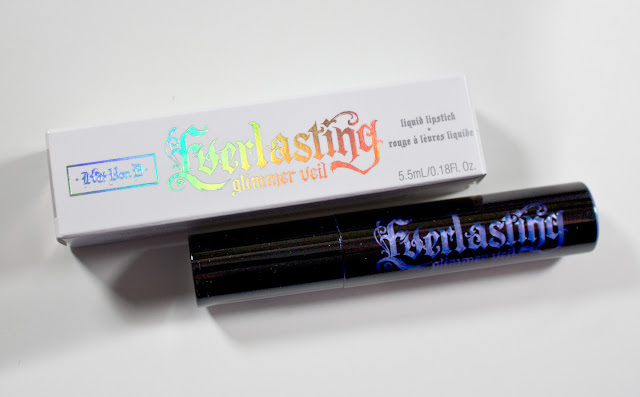 The Everlasting Glimmer Veil Liquid Lipstick formula is VERY thin in texture, it reminds me of the watery feel of a lip topper but has more of a gel substance while applying it like a liquid face cream. It goes on smoothly and easy to even the shade out before it dries down. The one thing I have to hand it to the formula, all the shades use fine milled Shimmer/Glitter particles to create the metallic effect for the colours. These don't feel gritty while wearing them like other glitters that are used in lip toppers and glitter lipstick kits. Now the downside for some is that all of these shades stain the lips but Starflyer was very minor at 5%, the shade barely a tint to my lips. The scent smells faintly of alcohol that dissipates quickly, and I found these easy to remove with Micellar Water or just water if you soak your lips with a towel. Starflyer is a lavender base with purple, blue, gold iridescent shimmer. 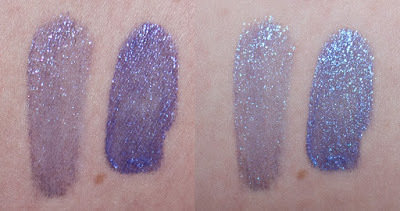 Wear: For the Kat Von D Everlasting Glimmer Veil Liquid Lipstick I get about 5-6 hours for the shimmer. The stain wears down and off after a day 12+ hours. 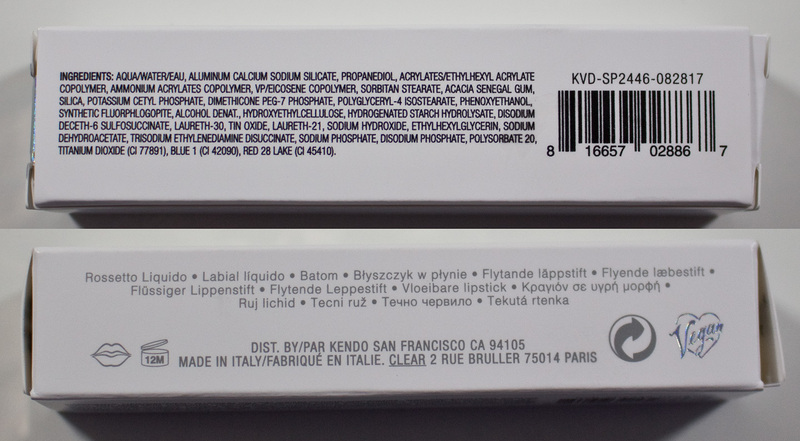 Packaging: Is a black blue with clear text reading Everlasting Glimmer Veil to see the product inside of the package. The applicator is a doe foot with a side divet felt tip applicator to grab more product on both surfaces to apply. The side divet makes it easier to apply most of the product with the doe foot tip is smaller to get a cleaner edge. Daylight & Flash swatches: Starflyer sheered out and 1 layer. One layer on lips only. Kat Von D Everlasting Glimmer Veil Liquid Lipstick in Starflyer & Lime Crime Diamond Crushers in Trip. Daylight & Flash swatches: Kat Von D Everlasting Glimmer Veil Liquid Lipstick in Starflyer & Lime Crime Diamond Crushers in Trip. Lime Crime Diamond Crushers in Trip is a sheerer less pigmented and slightly warm/aqua blue compared to Starflyer. This shade is a limited edition which is a shame because this type of iridescent toppers are the ones I like most. Loved to see more like this come out of the brand. 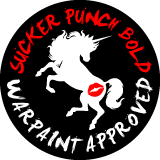 Definitely, one that looks good on its own or over other lipsticks.